This is a small species of spider crab, which hides among polyps of soft corals, Dendronepthya sp. Their body colour ranges from white, pink, yellow to red depending on the colour or its host. 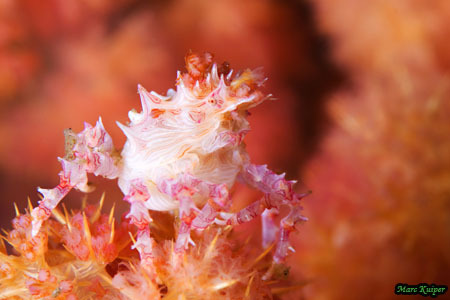 It camouflages itself by attaching soft coral polyps onto its carapace. 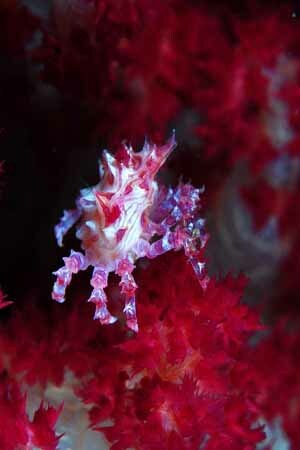 Their first pair of legs has small claws, they have a body with large spines, and they are translucent with red and white patterns, mimicking a soft coral host. Their body size is about 1,5 cm.